Washoe Forebay Spillway Channel Replacement. 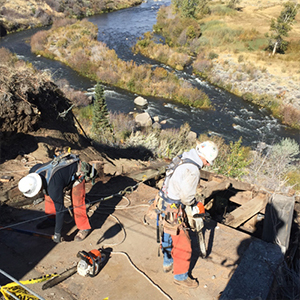 The worksite is located near Mogul, on the south side of the Truckee River. This project consists of replacing the Washoe Hydroelectric Plant wood spill structure and replacement of one of the concrete spill channel walls. The spill structure work includes demolition and haul-off of the existing wood spill structure, excavation, preparation and construction of anchored concrete footings, installation of new steel substructure and construction of new wood superstructure for the spillway. Replacement of the concrete spill channel wall consists of demolition and haul-off of the existing concrete wall, preparation for new footings, form work, and construction of a new reinforced concrete wall. Commissioned in 1904, the Washoe Hydroelectric Plant is the last plant in the hydroplant-river cascading configuration. This plant houses two 1.2 Megawatt Stanley Electric Generators driven by double horizontal New American Dayton Globe Iron Works horizontal double Francis type turbines each capable of developing 1200 Brake Horse Power while turning at 360 revolutions per minute. Approximately 395 cubic feet per second of water is utilized to turn the turbines. The water conveyance system between the Washoe head gates and the turbine is approximately 10,800 feet in length and creates a static head between the head gates and the turbine of 88 feet.